The administration of Nashik recently released 1,400 Million Cubic Feet (MCFT) of water stocks from Gangapur dam to meet the requirement of drinking water supply for the city and surrounding parts. 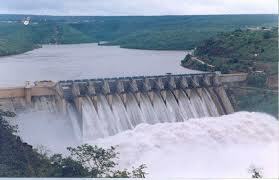 The water stocks released are supposed to fulfill the needs upto July 31. Along with the city, villages across catchment areas of Darna and Gangapur group of dams, will be benefitted with the current rotation of water stocks released. 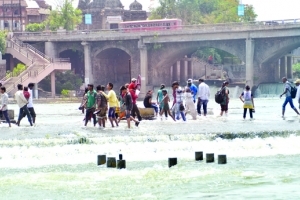 Soon after release of the water stocks from the dam, administration ordered the concerned department to disconnect the power supply of electric pumps across the areas between Darna and Nandur Madhmeshwar weir and from Gangapur dam to Nandur Madhmeshwar weir. Simultaneously, the administration has ensured uninterrupted tap water supply to prevent people from scarcity of drinking water in the meantime. Meanwhile, water level of river Godavari was increased due to this release of water stocks. As it was the day of weekly market, many of the small businessmen who often sell their products in Goda Ghaat area, had to search for another place due to rise in water level. On the other hand, children took advantage of this to get rid of scorching heat in the afternoon time on wednesday. Children were seen enjoying swimming and playing in water in Goda Ghaat area here. Citizens who were in the area for evening walk, also enjoyed playing in water with children.